Welcome to the Ottobock Wellness Library. What is wellness? It’s really about balancing the different parts of your life that allow you to live to your fullest potential. In the coming months we will present articles and tips to help you achieve positive changes in the following areas of your life: physical, emotional, environmental, social, intellectual, and occupational. You will also find support in getting back to the activities you love, whether that is golf, Pilates, or just living a healthy lifestyle. Each module includes multiple exercises that can be completed at different levels of difficulty, depending on your ability. The app allows you to set personal goals, track your progress, and even incorporate your own audio playlist into your program! Have you heard of Pilates but not sure exactly what it is? Ottobock asked three Pilates experts in the Minneapolis area, Emily Easton, owner of and Kristin Wallner, Instructor & Marcia Svaleson, Manager, of , to share their professional Pilates expertise and tips when considering an adaptive Pilates experience. Pronounced pee la teas, Pilates is named after the German physical fitness specialist, Joseph Pilates ( 1880 -1967). Pilates created a system of exercises using special equipment designed to improve strength, flexibility and posture. In fact Pilates was devised as a form of adaptive exercise for people injured by accidents or the affects of World War I as he sought to devise ways to help them restore their mobility and health. Pilates cleverly created exercise apparatus out of their hospital beds and using the frame and springs and created exercises to address the needs of the bedridden. Much of the modern exercises used today came from the background of rehabilitation. Today, Pilates is done in a studio with an instructor in private or small group class. It is an exercise that is highly adaptable to meet the needs of almost any level of fitness. Pilates makes use of spring loaded equipment designed to support the body even while providing challenge to the muscles. It also increases our body awareness through feedback delivered from the equipment and springs. The majority of the work is done lying down or seated. There is some call for standing or arm bearing, but it is easily modified. Pilates is generally more active, and is focused on improving your posture, alignment, breath, and use of the body. Pilates is a great choice for someone who wants to learn how to use their body well, to correct the misalignments, strains and painful patterns that keep us from enjoying our bodies fully, and achieve vitality, strength and flexibility to do more in their daily life with greater ease and enjoyment. 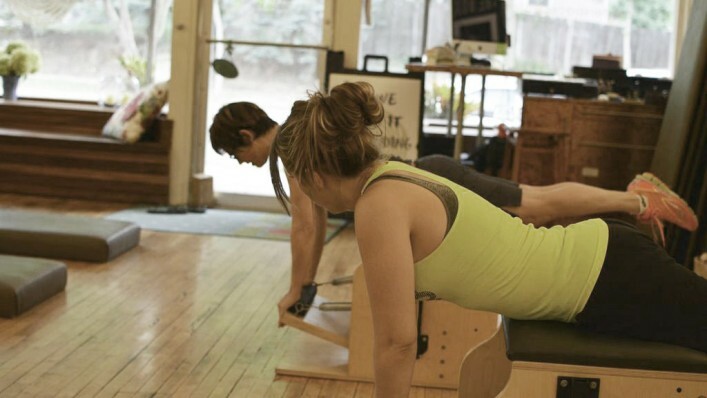 Many people living with limb-loss or mobility challenges find that Pilates allows them to reconnect to their body as a whole on a physical and mental basis. Visit. Schedule a time to come in with either an owner, or an upper level instructor to discuss your needs and goals. This gives you an opportunity to get a tour, meet other instructors, and see if the studio is a good feel/fit for your needs. Training. Start with reading the instructor’s bio. If you can’t find it on the studio website ask for it to be send to you prior to your visit. How comprehensive was their training? A reputable training program is a course with at least 600 hours of study and teaching. A very extensive training can be well over 900 hours with 250 hour of teaching prior to certification. Ask if he or she has been certified on all the equipment, or just one or two? Pilates is a very expansive system and makes use of several different pieces of equipment, each with its own strengths. If the instructor has experience with only one or two, they will be unable to provide you with a varied, adaptable experience. They should have a Reformer, Cadillac, Wunda Chair, Mat, and Barrels and be qualified and experienced teaching them all. In addition to initial training, find a studio that has committed to ongoing instructor education and inquire about the instructor’s recent Continuing Ed course. A reputable instructor will be registered and certified with the Pilates Method Alliance (PMA) and have logged at least 16 hours a year of continuing education credits. Chemistry. When you meet with your potential instructor, do they take the time to talk with you and learn about your expectations, needs, and concerns? Pilates is a wonderfully adaptive system, and can easily accommodate to almost any situation. The best lessons are when the instructor really applies what you want and need and helps you find the exercises that serve you best. Each lesson should be crafted to address YOU, and should be as unique as you are! Can they adapt if something isn't working for you? Do they work with you to have a successful experience? If you're getting the feeling you're being expected to conform to a standard set of rules and exercises, this instructor may not be for you. Even the best instructor may not be the one for you if there just isn't that chemistry between you. Can he or she really relate to you and give you instruction you understand, or do you find yourself scratching your head and wondering if you're doing it right? A good instructor is clear, concise, and knows how to explain things so you get it. Empathy. Does the instructor have experience with injury, trauma, or limb loss; either personal experience or with a client? Having an ability to empathize with a clients’ limb loss is important. Does their personality make you comfortable? If you're going to be working closely with someone, you may as well like them, right? It'll make the lesson that much more enjoyable. Equipment. Does the studio have access to a variety of equipment? In particular a Cadillac is a table like piece of equipment that extremely versatile for people with limb loss. Full studios have Reformers, Chairs, Cadillac, High Barrel, Small Barrels, Tower Stations and a variety of props at hand. Amenities. Does the studio have accessibility to restrooms? Private changing rooms? Identify the areas that are must haves for you and ask to see those things on your tour. As always we recommend that you please consult your physician or health care professional prior to beginning any fitness regimen. The Momentum Team had the opportunity to interview , a certified life purpose and career coach who has been featured in many media outlets including The Wall Street Journal, CNN, The New York Times, and the Washington Post. What is the first thing someone should do when they are faced with the possibility of having to change/modify/evolve their careers due to a traumatic injury? Career should never be the first concern with such a traumatic event, but once things have stabilized you'll need to return to living and "paying the bills." While it wasn't an injury, I experienced a traumatic event when my son was born three months early while we were on vacation. What I realized and learned was that you first need to stabilize. You need time to get used to and to understand the new current state--only then can you move toward returning to your career. That's how my husband and I did it with our son Mercer's early arrival. Once we felt comfortable in the "new normal", we focused on how to adjust our careers to fit our new situation. That situation was temporary, but I imagine many injuries might be too... not all, understood, but the steps are the same. Once you've stabilized, you are ready to focus on your career. It's best to get yourself in the right mindset. Given all you’ve gone through, it can feel like a burden to consider your career options. Too many people feel like the employment cards are stacked against them after going through an injury. It’s easy to fall prey to feeling that it will be a challenge. Let all of the fear and anxiety go. Replace that thinking with possibility. It might sound trite but it’s crucial that you allow yourself time to positively dream about where you could go from here. With this mindset, consider how this experience has highlighted your strengths and given you new perspective. It might have also reinforced your passion or highlighted a bigger issue/cause that you’d like to make your life purpose. Consider that there’s a contribution you’re meant to make and only you, with your unique set of talents and experiences can make it. What does your unique package of skills and experiences (your core genius) not only qualify you for but make you the BEST person for? You mentioned the phrase, "Core Genius." What is that and how does someone find theirs? Your Core Genius is what you’re here to do that only you can do. It’s the unique package of skills, experiences, passions, interests, talents, abilities, and attitude that you possess. It’s also what you’re here to provide – the service you’re mean to deliver. To find it, you don’t need to look far. IT'S INSIDE YOU. You’ve been using your core genius your whole life and people have been seeking you out for it. It just may not be the way you’ve been paid. I believe the best way to find it is to do a formal Soul Search and get specific about the elements of your ideal career. In my process I use 8 areas to help my clients Soul Search and get crystal clear the skills they enjoy using, the strengths they possess, what they value most and their life purpose. I also have my clients ask others to name their best skills, abilities and talents. It's amazing what you can learn when you put up the mirror and see what others see! How does someone balance the reality and fear of "I can't work, what will happen to me?" and "I need to find my Core Genius"? When is the right time to explore this when recovering from a traumatic injury? Clients often realize how fragile life is in the face of a traumatic event. Being from NYC, I worked with many people who started thinking (and approaching work) differently after Sept 11th, 2001. After that day, they realized that focusing on their "Core Genius" was not a luxury but a necessity. In getting used to the new current state, you have time when you can't return to the "daily grind" and can instead focus on thinking differently. Of course you need to approach it without fear.. to keep the proper mindset. At the heart of thinking differently is believing that the best way to find work is to focus on your Core Genius. It's the value, service, approach only you can provide. Yes, the injury has made you different from before but it's also an experience that contributes to your unique perspective - it furthers your Core Genius. As far as timing, it's important to take time to heal yourself physically, mentally and emotionally from the trauma. But you don't have to wait to focus on your Core Genius. In fact, focusing on the value you bring as you are now, in this way, is a very healing perspective. You're not broken or less than what you were. You're more. Adding experiences, even traumatic ones, enriches our abilities, talents and strengths. Mobility Challenges including limb loss can also be something a person has dealt with their entire life. What advice would you give people who might be categorized as "under-employed" their whole life? Find others who will be your biggest supporters, people who overcame such a trauma already. Research it online, look for inspirational stories and contact these folks. Ask for help. It's okay. Odds are they will offer advice and want to help you. I'd suspect they'd wish they had a mentor helping them, too. Just don't expect them to do it for you. You still need be the one to take action and maintain the proper mindset... nobody wants to help a "poor me". Also, don't wait for others to employ you. Employ yourself. Your core genius makes you naturally of service to others. That means, there's a job for you to do and only you can do it. Don't take your unique talents for granted. I remember one client who's core genius was listening. No matter where she was or what she was doing, other people would share their fears, hopes and challenges with her. I suggested she create a business card that said "Listener" and when people wanted to share their stories, that she politely let them know that she would be happy to set up an appointment for them and listen intently to all they have to say for a fee. My client initially balked at the idea wondering why anyone would pay her for listening. Then she found 7CupsOfTea.com - an online site where people hire professional listeners. She signed up to become a paid certified active listener. It's time to get to work using your Core Genius and get compensated for it. Stop looking at the want ads and instead start talking to anyone and everyone about the ways you are already being of service. Take seriously the value you are bringing to the table and believe (like my client above) that you can get paid to deliver it. Then, let others know what service you can provide and deliver it professionally and with high quality. You'll find you soon have more than enough work to do and you're making a living from it. Is education, more classes or certifications, the answer? NO, usually not. Everyone thinks, they need to be "official," but you are our core genius, you don't need to learn it. You need to formalize it by finding your first few followers / supporters / clients and have them help tell your story by sharing how you've helped them. Sure it sometimes helps to take classes, get certifications to formalize your Core Genius. For me, my CG is about helping people see their unique value and motivating them to put that value to use in service to others. When I took a career coaching certification program, I found a formal way to package my CG so others could buy it. It helped me to initially formalize what I do so I could start make a living from it. How has digital technology and the rise of the virtual worker played into people being able to translate their core genium into a viable career? It's easier now more than ever to tell the world who you are and what you do - and I mean the world. With technology, we can now market and sell to customers all over the world and we don't need a large company to do it. It levels the playing field... lowers barriers to entry. Anyone can now publish a book, create a calendar and offer their services with an online "shingle"/website. It is an amazing time. It is easier to rebrand yourself into something new. Using Social Media, one of my clients transitioned from a financial services career to become a well-known travel blogger in less than a year. With transferable skills you can leverage digital technology to work with people all over the world, regardless of your location. Mobility is less of an issue for securing a job. Where does someone begin this journey and are there resources for them to tap into? You're already on the journey and you've been delivering value with your presence since the day you were born. Having a traumatic injury is part of your path and it contributes to who you are becoming. For resources to start your own Soul Search and get/stay in the proper mindset, subscribe to my podcast and read my blog. You will start to see for yourself that you can make a valuable contribution b/c of everything that's happened to you, good and bad. Research and read the stories of others who've found purpose out of their traumatic experiences, surround yourself with people (even it's online) who value and appreciate you. Use sites like 15secondpitch.com to communicate you Core Genius to others. My son is thankfully thriving, and to celebrate we went to Walt Disney World for his 2nd birthday. Fittingly, Walt Disney said, "The more you like yourself, the less you are like anyone else. That makes you unique"...and that's valuable and that is the essence of Core Genius. To read Maggie’s blog or to follow her on Twitter, Facebook or LinkedIn visit . Over 2.5 million people have viewed Maggie's video on YouTube. CNN dubbed her, "one of the nation's best known career coaches." sharing her personal story of dealing with life and career changes. She is a certified life purpose and career coach and for 7 years hosted a weekly national radio show called . Maggie now hosts her own podcast.